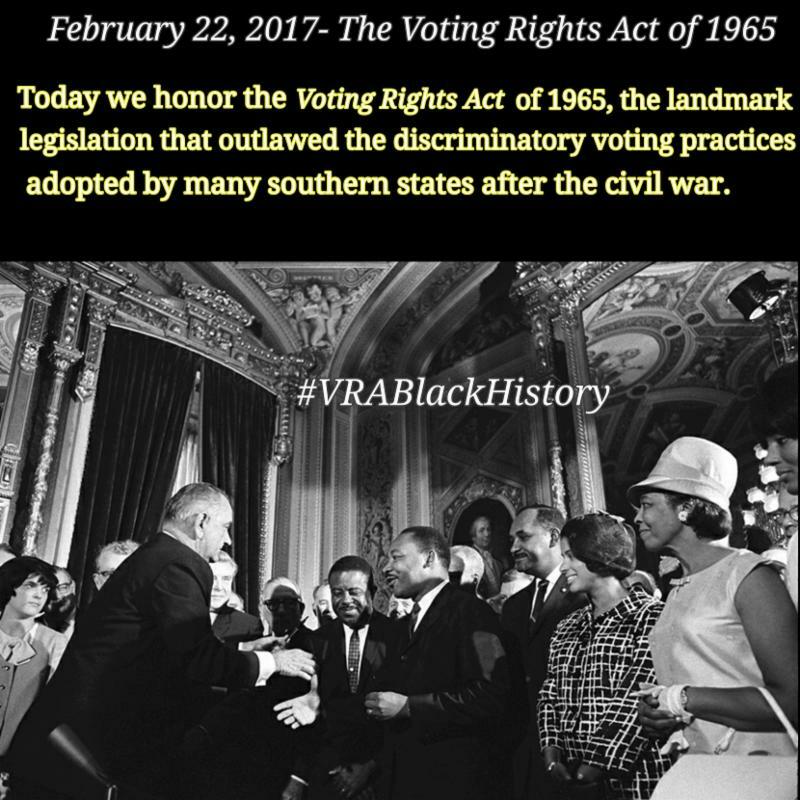 Today we honor the Voting Rights Act of 1965, the landmark legislation that "...outlawed the discriminatory voting practices adopted in many southern states after the Civil War, including literacy tests as a prerequisite to voting. This 'act to enforce the fifteenth amendment to the Constitution' was signed into law 95 years after the amendment was ratified." The key of the Voting Rights Act of 1965 is that it was truly transformative for African-American voting rights. In Alabama and other states voter suppression methods, such as grandfather clauses, literacy tests, poll taxes, and other obstacles, had virtually eliminated the Black vote and held Black registrants and voter turn out at a staggeringly low number. The Voting Rights Act set up these powerful provisions to give African Americans the rights and the legal tools to combat and overcome the disempowering voter restrictions. "Initially, these provisions applied to every Deep South state except Florida, plus Virginia and some 40 counties in North Carolina. And they worked, nowhere more obviously than in Mississippi, where the percentage of eligible black voters registered ballooned from 7% in 1964 to 67% just five years later." In a short period of time (within decades), African-American voter registration had significantly improved and there was a renaissance of African-Americans being elected to office. "By the mid-1980s there were more black people in public office across the South than in the rest of the nation combined [sic] Although the share of public officeholders still fell well short of the black share of the population, by 2001 the gap outside the South was nearly 4 times greater than within it." As you will see in subsequent articles, the Voting Rights Act of 1965 has been crippled by an assault of new voter suppression laws since 2011 and by the Supreme Court's decision of Shelby County v. Holder in June 2013. "Even in still-impoverished areas, black political empowerment has brought a noticeable increase in the share of state transfer payments. James Button’s study of six Florida cities shows black municipal employment quadrupling between 1960 and 2000, with blacks occupying 25% of the supervisory positions by the end of that span." "Maynard Jackson became Atlanta’s first black mayor in 1974 and by the time his successor Andrew Young left office in 1990, the city had granted almost 1,600 contracts to more than 600 minority-owned firms." The Center for Legislative Archives has compiled several documents, including speeches and letters written in favor of voting rights, that aided in the creation of the Voting Rights Act of 1965. Click here to view them. Article by: Caitlyn Cobb and Barbara Arnwine. Sources linked throughout the article in green.